Gamingwonderland.com is a website promoting a dubious extension. The add-on is known as Gaming Wonderland Toolbar and was developed by Mindspark Interactive Network, a known developer for potentially unwanted programs (PUPs). The website has plenty of online games and if you choose to download one, along with it, you will get the questionable toolbar. If you are constantly redirected to that site, you probably have a browser hijacker or adware installed on your computer. Both are not malicious computer threats but very annoying to deal with. Hijackers make unwanted changes, add useless features and try to redirect you to sponsored sites, while adware bombards your screen with advertisements. Both can be obtained via free software bundles so you need to be careful about how you install freeware. Make sure you delete gamingwonderland.com as soon as possible. How did the threat infect the system? It was attached to free software as an extra offer and you must have missed it during installation. When these kinds of offers go unnoticed, they are allowed to install. If you missed them, you probably used Default settings to install freeware. Those settings don’t inform you about anything being attached and you will not be allowed to deselect them. To prevent their installation, you need to select Advanced or Custom settings and manually uncheck all the boxes. Ensure that you uncheck every single box so that no unwanted offer can slip by, unless you enjoy having to remove gamingwonderland.com and similar. 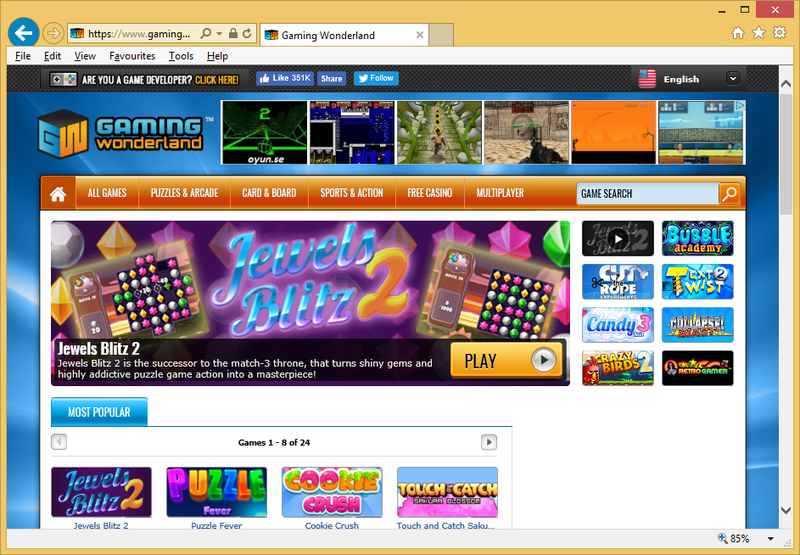 The website allows you to play various online games but it also promotes the suspicious Gaming Wonderland Toolbar. If you want to download a game, you will be prompted to install the toolbar as well. Reportedly, even if you deselect it during the game installation, it will still appear. It seems it’s able to affect all leading browsers, including Internet Explorer, Google Chrome and Mozilla Firefox. If you read the reviews for the extension in the Google Chrome web store, it will quickly become clear that the add-on is more annoying than anything. Many users report that it’s difficult to get rid of and that it’s not useful at all. It also has a rating of only 2 stars. The extension would add a toolbar to your browser and hijack your searches, possibly trying to redirect you to sponsored sites. If you are constantly redirected to this website, you might have an adware program on your system. Adware constantly generates pop-ups and redirects to make people visit questionable sites. Whatever the case may be, you need to uninstall gamingwonderland.com. When it comes to adware, browser hijackers and PUPs, you can eliminate them in two ways. If you have anti-spyware software, or are willing to obtain it, you can use it to delete gamingwonderland.com. This would be the quickest option as the program would take care of gamingwonderland.com removal. However, if you choose to remove gamingwonderland.com manually, you will have to find the hijacker yourself. Whichever way you pick, make sure you uninstall gamingwonderland.com fully so that it cannot come back.